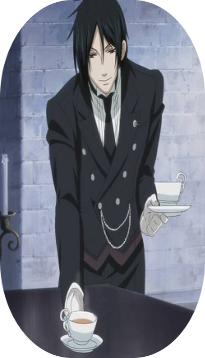 Lynus normally appears as a tall, slender male standing at 6'5” storm grey eyes, dressed in a black suit with silver buttons, pocket watch and pin showing the family he is in the service to and his position within the staff, white shirt, white gloves and black shoes. Lynus's history is steeped in mystery and it is not something he is willing to go into with anyone. What little is known about him is only known by a single person and that is the way he likes it, though to be honest if an 'accident' was to happen to that single person that would suit him all the better. The one whom knows this secret was the one who invited him into the guild that he is currently in and has served it loyally ever since doing whatever was asked of him without question. During his tenure within the guild he showed skill and efficiency that was not often matched by others, thus moved up the ranks within the combat specialists of the guild. It surprised him however when he was approached by the the only person whom knew his true name and original profession and given a 'request' of sorts that made the now Lynus quirk an eyebrow. He was 'requested' to look after the youngest son and then primary heir of one of the guilds main clients, being one to follow orders he agreed though he had no idea that he was then a guardian and manny to a two year old boy. He watched as the boy grew keeping him safe and teaching him hints and tips he believed would keep him safe later in life. When he was old enough not to need a 'nanny' like figure his position within the families service also changed, he became the youths personal butler, bodyguard and driver. 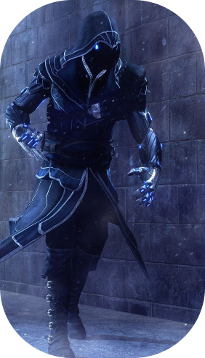 He made sure to follow the laws that the guild had in place not telling his young lord whom he truly was or the connection the the shadow guild that he believed to be the families personal boogie men. He however over his service had been gifted rare information that wasn't ordinarily given but due to his unshaken dedication, loyalty and the fact he had over time had seemingly become attached to the one he was contracted to tend to. He was however warned that if this information crossed his lips ever he would be exiled and hunted without remorse by the entire the strength of the guild. He accepted the terms saying that he would personally hand himself over for the punishment if he broke the oaths he swore when he was recruited. This happened five years ago and has kept the two sides of himself compartmentalised. This changed however when the young Ren was made to join his families darkened side, he has so far served as his young lord's personal servant for thirteen years and will continue in that task until the contract is cancelled by the current chairman.